The CV is pretty outstanding: forty years since his debut solo album, released or played on forty or so albums and written some 400 songs, not to mention recognized as one of the most innovative guitarists of the past forty years, Richard Thompson has nothing to prove. He could relax a bit, any signs of letting up though? Not really, it may have been some three years since his last album Dream Attic, but that’s not a great gap. Where Dream Attic was arguably a little overblown, Electric just sounds like a band getting on with things. Efficient is a horrible word to use in a musical context but the different tones and dynamics of the songs foil on this record, and it flows beautifully. Take the opening tracks and contrast the languorous gait of Stony Ground and the airy fayreground drift of Salford Sunday: a perfect complement. Even when the album takes a much darker turn with the visceral lyrics and heavy-trudge of Stuck on the Treadmill, coupled with the poignant My Enemy, the rolling Good Things Happen to Bad People barely ripples the continuity of the album. The album is littered with great moments: The Snow Goose, a beautiful madrigalish acoustic featuring Alison Krauss, the funk and roll of Straight and Narrow and the closing Americana of Saving the Good Stuff for You. Although there’s a relaxed ambiance about the performances (The influence of producer Buddy Miller?) it shouldn’t be mistaken for slackness. 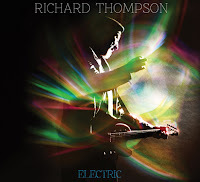 Richard Thompson’s playing is as inventive as it has ever been and the rhythm section of Michael Jerome and Taras Prodaniuk match him note for note. An album every three years? If that’s what it takes to produce a record as good as this, so be it.